Your one-hour photo session is broken into two 30-minute segments. The first 30 minutes is spent taking the photos, and the second 30 minutes is reserved for editing and selecting your favorites. Once you have made your decisions and placed your order, the photos (8x10 and smaller) will be ready for you to pickup in only one hour. Each one-hour session includes a maximum of three poses including prop and/or clothing changes, and can include multiple children. There is no need to schedule additional appointments for multiple children or entire families. We can accommodate families up to 10 people; larger families will be broken into smaller groups and put into a composition. We have a wide variety of seasonal and all-occasion props to help create that unique photo. Since we specialize in children, our colorful backgrounds help to capture their youthful spirit. 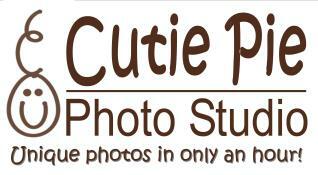 We have a wide variety of photo items for you to choose from when placing your order. Our prints (8x10 and smaller) are printed on specially-laminated paper for added protection; these photos do not even require glass when being displayed. If you are looking for something larger to hang on your wall, we offer both wall portraits and canvas wraps in a variety of sizes to fit that special place in your home. We offer a variety of personalized gift items, making it a perfect way for you to carry a special photo of your little cutie pie wherever you go. We also offer digital photos on CD along with a print release if you prefer that option.
."We have used the photographers at Cutie Pie (both in Marshfield and Weston) several times and I'm always very happy with the results. Fantastic pictures, printed while you wait, and most importantly they're very patient when it comes to working with finicky little ones who don't always want to cooperate! "